“Outside the cage I hate no one. Life is too short for that. In side the cage my Job is to destroy! Glover is done on Jan 26 n Chicago,” Rampage tweeted Tuesday night. 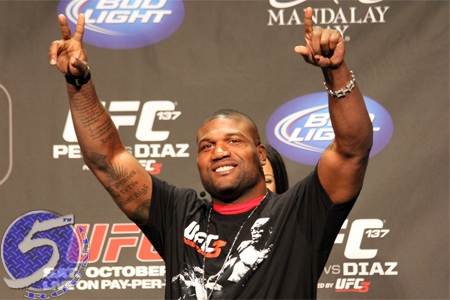 The light heavyweights were slated to battle at UFC 153 until Rampage was forced to bow out with an injury. Instead, Teixeira went on to beat Fabio Maldonado last month in Brazil. The scrap marks Rampage’s final fight inside the Octagon. After dropping a unanimous decision defeat to Ryan Bader at UFC 144, the former 205-pound champ went on a worldwide tour blasting the UFC for their inadequate pay structure and lack of appreciation. The 34-year-old then demanded to be released from the promotion, but UFC officials said they can go their separate ways after he fulfills the last bout on his contract. Rampage was forced to undergo surgery on both of his knees in March and has been on the mend ever since. Teixeira’s long-awaited big league debut had been postponed due to visa issues, but the Brazilian made up for lost time by quickly disposing of Kyle Kingsbury with a 1stRound arm triangle choke at UFC 146. The 33-year-old hasn’t lost a scrap since March of 2005, rattling off 17 straight victories during that span. United Center in Chicago, Illinois hosts the January 26th festivities.